In Stage 3, Part 6, Gregg experienced some serious downtime in Salta, Argentina after losing his credit cards. He traded Brooks in for his delinquent friend from college, Steve Gross, who was again traded for another wino buddy from San Francisco, Sr. Rodly. 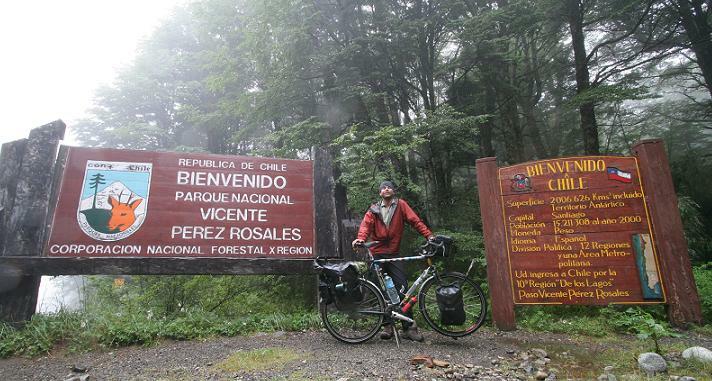 In the midst of spending time with his crew from back home, he also managed to cycle some 2,140 miles south through Argentina´s wine country, lake district, and then crossed the Andes one more time to Puerto Montt, Chile where he smelled the sweet salty air of the Pacific Ocean and pedaled at sea level for the first time in over 8 months. By the time Brooks, David Numero Uno, Don Thomas and I rolled into Salta from our brutal crossing of Bolivia I was completely burnt out. Maybe it was fate that led to my 4 week vacation from cycling when, at Brook´s going back home bash, I discovered that my wallet was missing my bank and credit cards when I went to pick up our bottomless Havana Club bar tab. To further complicate things, my friend Steve Gross and his chica were just a few days away from meeting me in Mendoza, Argentina, some 1,000 miles south. Strapped for cash-access and a rideable bike, (both rims were completely blown apart in the Bolivian desert) I took out a loan from the bank of Don Thomas and hopped a bus south with plans to return to Salta the following week to celebrate Christmas and New Years. My time with Mr. Gross in Mendoza was just what the doctor ordered. Thanks to the organization of Steve’s girlfriend, Dolleen, we spent our days sipping wine at private vineyard estates, learning how to cook traditional Argentine empanadas at a poshy cooking school, and getting pampered in warm Jacuzzi pools, steam rooms, and bubbling mud pits at the local day spa. On our last evening together, while strolling home from a mouth-watering steak dinner on Villanueva Street, Steve won ¨Man of the Year Award¨ when he clumsily dropped Dollen head first on the hard concrete sidewalk from her 6 foot piggyback perch. Needless to say, after nearly 18-months of being on the road, it was really, really, really, nice to spend time and catch up on current events with Sr. Gross (except for when he told me that the Crocodile Hunter died in a tragic stingray heart-spearing incident). After Steve and Dolleen´s departure, I packed up my bags and dashed out of our hotel room to catch a bus back to Salta to celebrate Christmas with Don Thomas. My departure was rudely interrupted when the hotel owner held me hostage in the lobby because of a credit card mix-up with the bill. In short, because I didn’t actually have a credit card anymore, I missed my bus, was threatened to be sent to jail, got stuck in Mendoza for 3 days, and spent a very lonely Christmas in an empty hostel. Without access to cash, I was too broke to even call home to my family. On Christmas day, EVERYTHING in Mendoza was closed except for the 5-star Sheraton hotel restaurant. There, I spent the last pennies of Don Thomas´ loan on a glass of OJ and a croissant while sitting at a special table on the patio outside of the hotel (they wouldn’t let me inside to dine with the other guests because I was not presentable enough). Upon my return to the hostel, the owner must of sensed my state of lameness as he gifted me a snickers bar, liter of Pepsi, and few minutes of conversation for my Christmas dinner. Eventually, I did make it back to Salta, rejoined Don Thomas for an epic New Year’s celebration, and received a new credit card after 3 weeks of it being stuck in the Buenos Aires customs office. On the 11th of January, on a fresh set of wheels and dogs, I spun out of Salta and south through Cachi, Cafayate and the heart of Argentina’s northern wine growing region. With money in my pocket for the first time in 5 weeks, I took full advantage of the 3 to 1 currency advantage of the dollar over the Argentine peso. Don Thomas followed suit, we BBQ´d fillet almost every night, drank the finest wines available (usually $3 to $10 US) and rarely traveled without an arsenal of peppery red Malbec or fruity white Torrontes which had replaced water in our bottle cages. I joined the famed Ruta 40 (similar to our Route 66) in Cachi and traveled passed sub-tropical forests full of flocking red-headed parrots, cactus deserts, the southernmost Inca outposts in the Americas, and 1,000s of miles of luminous grapevines en route to Mendoza Capital. While climbing the 10,000 foot Cuesta del Obispo to Cachi, I had an incredibly lucky birding experience as a huge Andean Condor, the largest bird in the world, swooped my bicycle twice. On the first pass he buzzed me from behind at just a few meters range. On the second pass, something I will never forget, he popped over a cliff-side road edge and buzzed me at less than 1 meter range, nearly knocking my off my bicycle. He then hovered at an arms length over my head with direct eye contact. This experience firmly landed the Andean Condor as my new favorite bird of the trip. A few days later, I met an Artisano at my campground who crafted me a silver Condor necklace to commemorate the experience and inspire even more luck along the rest of my journey. Unfortunately, the luck was short lived as just a few minutes later, I took a swig of dark ale and quickly discovered that a hornet had made his way inside the bottle. He landed his stinger and entire abdomen into a very sensitive area in the WAAAAYYYYY back part of my throat. The campground looked onward as Don Thomas pulled the stinger out of my throat with his Leatherman pliers. My throat swelled shut but I did get to enjoy several days of guilt-free non-response to Don Thomas´s post 3rd glass of wine gibberish. I cycled with Sr. Rodly from San Francisco to Santa Barbara on the ¨Sideways¨ California wine tasting Ribbon of Road side-trip. Upon reaching Santa Barbara, he promptly exclaimed ¨Dude, if you actually ever make it down to the Argentina wine district (Mendoza) alive on this trip, then I’m coming down to do this with you again. I emailed him with the coordinate about two weeks before reaching Mendoza, and he showed up on my hostel doorstep, as promised, with his Dad’s vintage lime green mountain bike and Brooks´ neon yellow bike bag set. Rod makes wine in his garage back home and it’s safe to say that he is about as big of a wine geek as you can get in this world. We organized an epic two-week wine guzzling side-trip south of Mendoza to San Rafael. From backyard bodegas to uber-Euro-style multi-million dollar mega estates, we hit em’ all. Rod tried his best to coach us in the art of wine consumption but with my constant fingerprint smearing and ongoing battle to discover flavor nuances -- ¨hmmm, great oaky finish huh Rob?¨, ¨dude, this one is aged in stainless tanks not oak barrels¨ -- and Don Thomas´ interest in quantity over quality ¨taste pretty good to me, how much for the bottle?¨ -- Rod gave up on us after the third day. Rod spent his birthday hovering over a private, 12 course lunch under a covered veranda at Bodega Altus, then hit the Andean lodge vineyard of Andeluna, got electrocuted by the zap of a nearby lightning bolt (more on our getting struck by lightning in a following post), and then got belligerently tossed when a group of local cowboys gave him a horse-whip and then made him pound beer for the next three hours. He finished the night off in style as he passed out in a ditch behind an unoccupied police station. After two weeks of short cycling days and wine-binging with Rod, Don Thomas and I realized that we were now seriously behind schedule. Summer was almost over and we still had thousands of miles ahead of us to reach the end of the world in Ushuaia before the high passes freeze over and become impassable. In San Rafael, we gave our steeds a nice tune up, pointed them south and rode for 22 of the next 25 days to Puerto Montt, Chile. The cycling was spectacular as we entered Patagonia for the first time, skirted through the Andes along the Chilean border through ancient forests of Monkey Puzzle trees and pedaled past countless alpine lakes along the famous 7 lakes drive through Argentina´s Neuquen province. In San Martin de Los Andes I had a long anticipated reunion with Ruth and Horst, the Swiss/German couple who nursed me back to health after my attacks in southern Mexico and pulled me along with them through Central America. We’ve been in email contact for almost 1 year since we parted ways in Panama City in anticipation of joining forces and riding out the end of the trip together. It was a grand and emotional celebration as we stayed up late into the evening trading our experiences and impressions of South America. From Bariloche, the 4 of us decided on an alternate east to west border crossing to Chile that involved cycling to the ferry dock at Puerto Panuelo, taking a ferry to Puerto Blest, cycling again to Puerto Alegre to catch another ferry to Puerto Frias, and then cycling through a national park and over a pass across the border to Chile to Peulla. 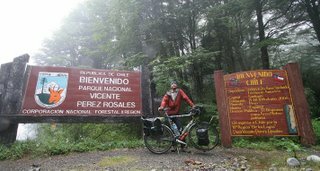 In Puella we took another ferry across Lago Todos Santos to Petrohue where we then rounded out the stage by cycling to Puerto Montt. Along the way, I got my first case of Montezuma´s revenge since northern Peru and spent the night hunched over and shivering in my sleeping bag behind the Argentine customs post in Puerto Frias. In Puerto Montt, I spent a day off the bike planning and plotting the route ahead along the Carratera Austral, a 1,000k dirt road traversing the wild and sparsely populated southern 3rd of Chile. Since our past update, Gregg has rallied 2,500 miles and is rapidly running out of continent. Since nearly drinking Argentina out of red wine, he's crossed lakes, got stung by bees, struck by lightning and crossed over the andes one last time to chile. His current position - Puerto Montt Chile.